Have you been thinking about what is the best sewing machine for beginners but you’re not sure where to start? There are so many sewing machines out there that it can be overwhelming for a beginning sewer, or someone returning to sewing. It helps if you can reflect upon the type of sewist you will be, and your plans for sewing. You also will have different metrics if you’re buying for yourself or if this is going to be a present for someone who is starting to sew. There are many kinds of projects you can sew. You can sew clothes, and you can also just be interested in altering and mending clothing. You could want to sew home decor like slipcovers or more intricate projects like pillows. And if you want to sew draperies, you will want a different type of machine that can handle thicker fabrics. And quilting brings quite a few options to the table. Some people only want to make small quilts, and others want to make king-sized quilts. There is thin batting as well as high loft batting. And some people quilt cotton and others piece together old t-shirts and clothing to make memory quilts. I know it is very confusing, just stick with me. I’ll make it as simple as possible to pick your first sewing machine as a beginner. 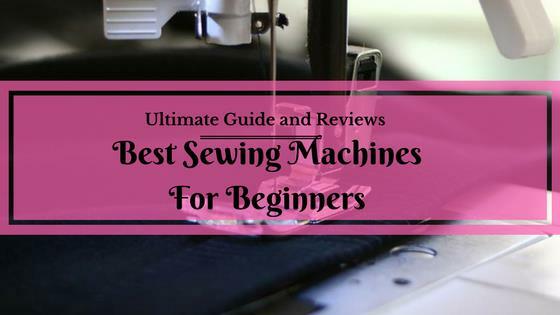 First I’ll show you some of the options below, and then I’ll go over the ultimate buying guide to choose the best sewing machine for beginners at the end of this article. Brother CS6000i came on top in many different categories for starters. Click here to check the current price of the Brother CS6000i at Amazon. Janome HD3000 came on top in the manual sewing machine category. Click here to check the current price of the Janome HD3000 at Amazon. Singer 4423 is the best singer sewing machine for starters. Click here to check the current price of the Singer 4423 at Amazon. I did some research into the best sewing machines for beginners in 2019. Some of it is based on my personal experience playing with the machines, and the rest is based on other reviews and feedback. I narrowed it down to the top three reliable yet affordable brands and their entry level machines. Then I compared the machines to the requirements below and concluded with my recommendations. Figure out your budget and buy the best machine you can afford that has the features that are most important to you. First, we’ll look at all the machines I liked from Brother. The Brother CS6000i is a great beginning sewing machine if you want the additional functionality of a computerized machine. It also has the 60 built-in stitches and the ability to chain stitches together for custom decorations. These aren’t essentials, but they do make life easier. The bright sewing light also helps you to see where you’re sewing better. What I like is that it’s easy to set up. It has a drop-in bobbin. A start/stop button is letting you sew without needing the foot pedal. It is useful if you’re doing a lot of small sewing seams and want to start and stop quickly. It also provides variable speed control allowing finer sewing control. If you’re sewing a lot of layers or sewing a lot of curves, you will want to go slower naturally. And if you’re sewing long straight seams like the binding on a quilt, you will want to go as quickly as possible. The machine’s oversized sewing area is perfect for quilts and other large projects like curtains or skirts. With other sewing machines, you would want to buy a separate table for a larger sewing surface. Having a bigger and more even sewing surface helps you to keep stitches more even with better feeding into the machine. The accessories are stored in a compartment that’s easy to pull out. The machine comes with nine presser feet. That’s more than the usual sewing machine and allows for many types of projects that a beginner would be trying. The negatives aren’t too many, but I do want to mention them. You can’t adjust the foot pressure. That means this sewing machine can’t handle many layers of cloth or very thin fabrics. If you force it, you may mess up the timing and need a professional to repair it. Plastic machine body may not last reliably. Some negative reviews were because the machines were defective and the sewing table did not lay flat. Others had difficulties getting even tension. The best advice was to ensure you have a Brother certified repair center near you in case you need warranty repair work. This is a very well loved machine, and the majority of people gave very positive reviews. It is a very light weight which can be great to bring to a sewing class or quilting circle. However, need to be careful don’t knock it over. The Brother CS6000i is the best sewing machine for beginners because it’s easy to get set up and sewing quickly. The price is excellent for all of the functionality. Click here to buy the Brother CS6000i from Amazon. The Brother XM2701 is an entry level mechanical and basic sewing machine. This machine has easy bobbin winding. It also is a bit more heavy duty, and you can sew denim. The negatives were that some of the feet were made of inexpensive plastic and would not last. Others felt the LED light wasn’t bright enough. And some people felt that the floral decal was juvenile. This can be a great machine for young sewing enthusiasts just starting out. But for the majority of beginning sewers, you’ll be better off spending a little bit more to get a better quality machine. Read our full Brother XM2701 review here. Click here to buy the Brother XM2701 from Amazon. The Brother LS2125i is an entry level mechanical sewing machine. This sewing machine can handle heavy fabrics with the correct needle. This Brother beginner sewing machine has a thread tension which gives you control over your sewing. This can be good and bad. It’s good if you’re comfortable sewing and know how to adjust tensions. It also has a very easy to read stitch selector dial. You will know exactly what you’re selecting. The Brother LS2125i also has a very easy to use bobbin winder. There is absolutely nothing fancy about this machine. Few built-in stitches. The pressure on the presser foot is not adjustable. Some people reported difficulties in sewing very thin fabrics. It’s made of inexpensive plastic that may not last a long time. Although it’s very limited with its built-in stitches, this can be good as there’s not a lot to distract you from simple sewing and learning how to sew. This can be a good machine for a starter since Brother tried to make it simple to set it up and use it for a very affordable price. You may outgrow it faster than you think. If your budget is limited and wanting to see if you even like sewing, this can be a very smart choice. Click here to buy the Brother LS2125i from Amazon. The Brother XM1010 is an entry level mechanical sewing machine. This Brother beginner sewing machine is lightweight and designed for everyday sewing, alterations, and mending. This machine has an easy-to-use stitch selector dial and a built-in free arm. There is also manual thread tension control. It is solidly built with internal metal working parts that will last longer than other lightweight machines. It is a very sturdy hard-working machine for the price. Once get used to it, it’s a great machine. The Brother XM1010 also had the 25-year limited warranty. The feed dogs didn’t move as smoothly as other machines at this price point. Also, you cannot drop the feed dogs for free motion sewing. You would have to purchase an accessory to cover them up separately. Another negative is that the power cord is short. It’s probably better as a backup machine for experienced sewers as the Brother XM1010 has a few quirks that may be off-putting for a starter. If you don’t mind investing time into learning a machine, this could be a very good one. But otherwise, it’s not one of the best for those completely new to sewing. Click here to buy the Brother XM1010 from Amazon. The Brother XR9500PRW is a computerized machine with 100 built-in stitches and a fold-out quilting table. This sewing machine works well on a variety of fabrics. It is considered a heavy duty machine so you can sew on multiple layers of denim with the correct needle. It’s unique in that it has a super-wide (7mm) zigzag stitch. This can be useful for making larger decorations. This beginner sewing machine has a built-in sewing font for basic monogramming. It also has a large back-lit LCD screen which is easy to read. The built-in stitch guide is very handy for finding the stitch you want on the sewing machine instead of having to keep the owner’s manual out. Other great features are an easy bobbin winding system, a free arm, and a bright LED light that is positioned well. You can also adjust the needle position for doing off-center hemming work. You can also control the Brother XR9500PRW with a push button on the machine to sew without the foot pedal. The onboard computer is somewhat programmable. You can program in a word, and it will stitch the word without having to stop. When it’s done, you can delete the word and go on. It can store 55 characters at once, and that includes spacing. So if you want to stitch more words than that, you will need to go in batches. This machine has the standard 25-year limited warranty. Some people had issues with tension. It could have been caused by the bobbin being wound improperly or not being set in the machine correctly. This pressure to get it all right could be intimidating for beginning sewers. Some beginners may be put off by all the options this machine has to offer. Keep in mind that it’s not an industrial machine, so you won’t want to be doing super heavy duty sewing every day all day. If you’ve taken a sewing class, this could be the perfect machine for you as it has a ton of functionality for a great price. You can read my full review of Brother xr9500prw here. Click here to buy the Brother XR9500PRW from Amazon. You can hem jeans with the proper needle and careful sewing. While you can’t drop the feed dogs, there is a darning plate included that will cover them if you want to do free motion sewing. This machine also can sew very thin fabrics easily. This is great if you want to sew a lightweight shirt or sheer curtains. The Brother XR3774 is very easy to setup and use. It’s heavier than some of the other machines we’re looking at. But it is fairly lightweight at 15 lbs. Like the other Brother sewing machines, this one comes with a 25-year limited warranty. It does not have a built-in thread cutter. I love having it available, so I don’t have to look for my thread snips when I’m in the middle of sewing. It is not a heavy duty machine so you wouldn’t be able to handle many layers of denim or canvas on a regular basis. So with all the positives and few negatives, this is a decent Brother sewing machine for beginners. Here is my review of Brother xr3774. Click here to buy the Brother XR3774 from Amazon. Brother cs6000i is one of the highest rated for a reason. It works well and is easy to use right out of the gate. You will have fun playing with the decorative stitches, and you will be pleased with the quality of the straight seams. I think this machine will be useful for complete beginners as you’ll get hooked on sewing, and then have a great machine to grow with you. The Singer 1234 sewing machine is great for beginners. It’s a sturdy mechanical machine with a metal frame and a free arm. This machine is targeted towards the younger crowd. Singer provides vinyl stickers to encourage you to decorate your machine. The Singer 1234 has a bright LED light. It’s an everyday machine that can sew denim and heavyweight fabrics but not multiple layers. So could make the tote bag and hem jeans with the correct needle. Also included is a project sheet for a tote bag making it easy to get used to sewing with it. This machine easily sews on lightweight fabrics. It’s great for beginners because there’s not much you can mess up with it. Everything’s built-in. For example, it has the automatic tension which detects your fabric and adjusts the tension to maintain smooth stitches. You couldn’t do thick quilts or more than a few layers of fabric on a regular basis. This machine is better suited towards someone sewing simple household projects or apparel. You would probably outgrow it if you really took to sewing. For the price, you’ll get a quality sewing machine that’s easy to set up and use. This may be a better machine for the younger crowd starting out. Click here to buy the Singer 1234 from Amazon. This beginner sewing machine is the kind that you will continue to use as you grow. The Singer 4423 has a heavy duty metal interior frame and stainless steel bedplate. You can sew at the very fast rate of 1100 stitches per minute. Typical machines are around 750-900 stitches per minute. This machine also has a heavy duty motor. You can sew through a large number of layers of difficult fabric with ease. You can also sew all day long, and the machine won’t overheat. If you’re interested in cosplay or re-enactments, this sewing machine can handle any costume material you throw at it. The most difficult thing I ever sewed many years ago was a cloak that had about 15 layers at one seam that I was trying to sew. I wish I had this machine back then. This machine is still considered lightweight at 17.5 pounds even though it’s a heavy duty machine. While it’s easy to use, it may be intimidating for beginners as the foot pedal doesn’t have much play. It starts out at a good speed and then just goes faster. It could be great for you if you like the idea of sewing fast with no limitations on what you could sew. It also provides a high-quality straight stitch and zigzag stitch which are the foundation of all sewn projects. You can check my Singer 4423 review here. A common mistake some sewers make is not lowering the presser foot when sewing thick layers. That will cause the machine to not sew properly and have bobbin thread bunching up underneath. Click here to buy the Singer 4423 from Amazon. This machine is easy to thread and has an easy to read LED display. What makes it great for beginners is that it automatically adjust the stitch length and width based upon your sewing. The automatic presser foot pressure detects thin and thick fabrics for even feeding. It also has an electronic autopilot allowing you to sew without the foot pedal and easily adjust the maximum speed. This is a fancy way of saying you can control sewing from the machine. You will need to unplug the pedal before using this. The Singer 7258 has a long power cord making it convenient to set up in a variety of places. It also has a programmable needle up/down so you can stop sewing and have the needle go to an up or down position which is useful for pivoting and quilting. This beginner sewing machine also has a speed control lever allowing you to adjust the sewing speed from low to high. The sturdy metal frame is perfect for skip-free sewing of any project. It’s also lightweight so you can move it around easily. One negative is that you can’t drop the feed dogs. However, the machine comes with a darning plate to cover them so you can do free motion sewing. For the price, this is a great computerized machine. It’s geared towards beginners and has many features that you’ll use as you expand your skills. You can read my review of Singer 7258 here. Click here to buy the Singer 7258 from Amazon. This machine is very easy to thread out of the box. It also has an adjustable presser foot control so you can adjust based upon what you’re sewing. It can handle thin and thick fabrics with ease. This machine is great for beginners as it’s straightforward, powerful, and you’ll have a good experience sewing with it. It won’t break easily. You can adjust the needle position to left and right of center for enhanced seaming. What I also love is that it makes a great straight stitch. Since most of your seams will be straight, you want the best quality stitch you can get. This machine has a limited 25-year warranty including two years on electronic components and 90 days on adjustments. This is a good beginner sewing machine from Singer. It’s easy to set up and use, and you will be able to sew most things. You can read my Singer 4411 review. Click here to buy the Singer 4411 from Amazon. You may not think something this advanced sounding would be a good beginner machine. But it is. It’s easy to setup and use. It has Singer’s “Swift Smart Threading System.” You just need to guide the thread from the spool to the needle area through a single groove and then use the automatic needle threader, and you’re done. It also has a presser foot sensor, so you don’t start sewing with the presser foot raised. There are also good error messages to help you identify and fix any problems that come up. This machine has a large sewing surface. This helps when you want to spread out your project and have an easier time sewing without worrying if you’re going to sew over another part of the project. It also has a start/stop button and speed control on the machine allowing you to sew at your own speed with or without the foot pedal. There are many stitches. They’re easy to choose using the LCD screen and button controls. You can set the needle to finish in the up/down position. The reverse is automatic, and you don’t need to hold down a lever. You can do pattern elongation for advanced embellishment. There is stitch memory with editing. There is a built-in block alphabet and numbers so you can create personalized projects. The Singer One Plus is heavier at almost 25 pounds. But that also means you can work on larger projects without fear of the sewing machine skipping or tipping over. This is not considered a heavy duty machine. You wouldn’t be able to handle thick layers or leather. You could hem jeans with the right needle and sewing slowly but not on a frequent basis. One negative is that you have to unplug the foot pedal to run sewing from the actual machine. So you’d have to decide which way you were going to be sewing rather than making a quick decision on the fly. While this may not seem like a good beginner sewing machine because of all the features and slightly higher cost, it’s actually very beginner friendly. Click here to buy the Singer One Plus from Amazon. For starting out, it helps to have a solid machine that will sew straight seams easily and well. There aren’t a lot of things to go wrong on Singer 4423 sewing machine, and you will be able to sew most things. It’s got a One-step automatic buttonhole and automatic needle threader to make sewing easier. It’s fast, and you can adjust the position of the needle for better seam work or add in cording to pillows. The price is great for a heavy duty machine with excellent straight stitch capability. This is easy to use beginner’s sewing machine that can handle most home projects. It’s easy to thread and has a simple bobbin winder. A bonus is the five piece feed dog providing more precise fabric control. And you can drop the feed dogs for free motion sewing. It has a high presser foot lift. You can also move the needle position to the left and right of center. Janome offers a 2-year warranty with a limited 15-year extended warranty. One downside is there’s no automatic needle threader. This is a top notch sewing machine for beginners as everything is easy to set up and use, and it provides high-quality results. Here is my Janome 7318 magnolia machine review. Click here to buy the Janome 7318 from Amazon. Bright two digit LED screen for simple stitch selection. Drop feed dogs for free motion sewing. It also has a seven piece feed dog that can detect and adjust for fabric weight from very light to very heavy. And it’s easier to use for a beginner because of the automatic thread tension and presser foot pressure. Unfortunately, the manual is poorly written, and people go to YouTube to learn to use this machine. It may seem to be a higher price point for what you get. But do keep in mind that this is a very sturdy machine that can handle almost everything you throw at it. This is another amazing sewing machine for a beginner because of the automatic thread tension and presser foot pressure. Here is my Janome 8077 review. Click here to buy the Janome 8077 from Amazon. This sewing machine is perfect for a beginner because it’s lightweight and solidly built. You adjust stitches with a simple dial. Free arm and drop feed dogs. You can sew multiple layers of fabric. It is designed to work with heavy fabrics as long as you use appropriate needles. Having said that, It’s not a heavy duty machine, so won’t want to sew through eight layers of canvas or denim on a regular basis. One downside is that it has a vertical bobbin, not drop in. It can take a bit of practice to get used to putting in the bobbin. It doesn’t have speed control other than pressure put on the pedal. And no automatic needle threader. If you can get used to a vertical bobbin, this machine could be a good choice for beginners. Here is my review of Janome 2212 review. Click here to buy the Janome 2212 from Amazon. The Janome HD3000 is on the heavier side of lightweight machines but still under 20 lbs. It’s built with a stronger motor and metal frame. Can sew through many layers of denim as well as two layers of silk and still get a great stitch. It’s very easy to use, and Janome provides a good manual with clear instructions. You can adjust thread tension. When you’re experienced, you will want this control. When first starting out, you’ll want to find something simple and let it be until you’re more comfortable making adjustments. Anyways it’s a great feature to have. One of the downsides is that it also has a vertical bobbin. ​One other downside is that I couldn’t find the warranty information online for this machine. This is fun to use a machine that will grow with you. I whole heartily recommend this machine for any beginner. Here is my full review of Janome HD3000. Click here to buy the Janome HD3000 from Amazon. Janome HD3000 is a great heavy duty machine that can handle anything you throw at it. It’s adjustable and has my favorite automatic needle threader. It’s also very reliable and a machine you’ll be using for a long time. If I could only choose one machine, I would choose Brother CS6000i because it has the best of all worlds. Although it is a not specialized sewing machine, it’s the one of the easiest to use machine that provides the high-quality stitches. It offers enough versatility that you can grow with until you’re more confident and know what additional features you want to have. It’s a solid machine from a reputable company. And it’s a #1 bestseller on many online retailers, so you know a lot of people have tried it and loved it. For the best manual machine, the Janome HD3000 edged out both the Singer 4423 and 4411 for one reason. The interface was easier to use on the Janome than the Singer. The Singer uses dials that are easy to rotate, but you have to move your head to see where you’re at. The Janome HD3000 uses sliders that are very clear with where you are and where you want to be when choosing stitches, stitch length and stitch width. For the best computerized machine, I would recommend the Brother CS6000i because it is jam-resistant and easy to use. The ability to stop the machine with the needle in the down position for easy pivoting or close work is such a great feature. And finally, I loved that you can adjust the speed control. The first question to ask is if you’re buying this machine for yourself or someone else. If you’re an experienced sewer buying this for someone who wants to create just like you do, you’ll have to remember what it’s like to be a complete beginner. Most people want to be experts right out of the gate. Having a reliable machine can help with this. If the new sewer is constantly having to rethread the machine or remove jams from the bobbin thread, they will quickly give up. And people want their projects to look nice. A cheap machine won’t sew straight well causing puckered seams. This leads to clothing not fitting well, and much disappointment for the beginner. Next, you will want to evaluate what kind of sewing the owner will do. If you are just going to be doing a lot of straight seam sewing like quilts, you won’t need a machine with embellishments. If you want to do repairs or alterations, you will want a free arm on your sewing machine. Will you be taking the sewing machine to a class? If so, you will want a lighter machine, or you will want to look at travel cases. Will there be a dedicated space for sewing, or will the machine have to be put away regularly between sewing sessions? How is the manual dexterity and eyesight of the person who will be sewing? Some beginners sewing machines have automatic needle threaders which makes threading the needle much easier. Some bobbin winders are easier to use than others. And drop in bobbins are easier to set up than vertical bobbins. Although, some people feel that vertical bobbins are easier to fix after getting a jam, drop in bobbins are more resistant to jamming. One thing I hadn’t thought about until I started research is what to do if the machine needs warranty repairs. Are there authorized dealers near the person sewing? The truth is, you should scout out a reputable machine repair place anyway in case you need adjustments or repairs over the years. Know what you need out of the machine when you buy it. For example, if you want to learn to sew your clothing, you will be progressing from simple seams into more complicated sewing. Adding on a collar requires a lot of tight seaming where you start and stop frequently while pivoting the material. Computerized machines have the ability to stop the machine with the needle in the down position. Mechanical machines would have to be manually adjusted. You may want to look for a machine that will grow with you instead of one that you may need to replace in a year or two. At this point, you will want to firm up your budget. That may help make some decisions. I will say you should buy the best machine you can afford. And if there’s one that’s a bit of a stretch, save up the extra money for it. Your future self will be thanking you. The flip side is that if the machine is more advanced than your skills, you may be struggling and fighting the machine and not learn how to use it. Or you may get distracted by all of the stitches and not focus on learning to sew simply at first. What kind of fabric do you like? Will you be sewing more challenging fabrics like thin silks, stretch knits, or heavy denim? And that’s just the start of the questions. You may not know right now. And that’s fine. It’s good to keep the questions in mind as we go through some of the major considerations in choosing a beginner’s sewing machine. Mechanical sewing machines don’t have as many stitches as a computerized sewing machine. But when you’re starting out learning to sew, you usually only use three or four stitches. If you know you will want to do embroidery or quilting, you may want to invest in a computerized model at first. Mechanical machines require less maintenance than others. You only need to keep the bobbin area clean of lint, and oil according to the manufacturer’s directions. Computerized machines may need to be brought in for the occasional tune-up as well as the regular maintenance of cleaning and oiling. And when it does, it will be more expensive. The good news is that there are some very affordable computerized sewing machines available for beginners. You can find out about the best mechanical sewing machines in this separate article. In a basic sewing machine, you should look for a good straight stitch, zigzag stitch, and a buttonhole stitch. These are the ones that you will use the most. A built-in stitch is one that the machine can do out of the box. You don’t need to program in anything. You should also evaluate stitch length and width adjustments. Standard machines are around 6mm wide and 4mm long. Look for a sewing machine that offers an easy way to change stitch settings. Mechanical machines use dials, and computerized machines use buttons with a display. If you want finer control over the width and length, you will want a computerized machine. The mechanical machines have the adjustments pre-set. In a computerized machine, you can take their built-in stitches and combine them which is sometimes called chaining stitches. Then place your fabric and press the pedal to have the stitches appear. This is useful for monograms or decorations. If you’re interested in decorating items of clothing or household items, you will want a computerized system. By using special thread and chaining stitches, you can embroider hems of linen handkerchiefs or napkins. You can also monogram lunch bags that you made. There are a lot of fun things you can do with the decoration stitches after you’ve become comfortable using your machine. You can make some of the manual sewing machine stitches look like embroidery by adjusting the stitch length and width. However, it won’t be as versatile with as many options as a computerized system. And as I mentioned previously, if you’re interested in monogramming, you will want to find a computerized system that can do that. Some machines advertise their high power motors which are designed for heavy duty sewing. A powerful motor can be useful if you want to sew those kinds of projects. However, if you’re just learning to sew more basic projects, you will want to have good control over the speed and pacing of your seams. A powerful motor may go faster than you’re comfortable. That leads to a lot of seam ripping because you overshot or didn’t control the fabric well and sewed where you didn’t want a seam. You also need to ensure that the machine has a powerful enough motor. Nothing is more disappointing than having a machine that has trouble keeping up with your projects or grinds to a slower speed when you hit a few layers on a seam. Some machines are advertised as being “heavy duty.” Those tend to have a metal frame and are designed to sew through numerous layers of materials or heavier material like vinyl and canvas. The question is how well do they handle more delicate fabrics. Some regular machines can handle heavier fabrics and can quickly switch to the more delicate. They may not have a metal frame, or they may have wanted to brand themselves as a good machine for beginners sewing a variety of projects. You should also look at the feed dog adjustments. You want your feed dogs to work well and able to feed through all kinds of fabric without bunching up or letting the fabric pull down into the bobbin area. There should be a fairly even feeding of fabric. While you may think this is similar to the power of the motor, it’s a little different. You do want a good motor and solidly built machine. A heavy duty machine is designed for handling more industrial like projects but isn’t an industrial machine. Metal frame does tend to provide a sturdier feel to the machine. Plastic isn’t to be ignored. There are some well-designed plastic based machines that are worth looking into. Metal frames don’t necessarily mean better quality. There were a lot of bad sewing machines produced after 1950 that were metal based. New machines from a reputable manufacturer will provide good quality whether they’re metal or plastic. A metal frame machine will be heavier. This is good if you’re sewing large or heavy projects. Your machine won’t skip around the table, and it won’t fall over. The stitches will be created more evenly. When choosing your beginner’s sewing machine, you will want to go with a reputable company for a few reasons. Established companies like Brother, Singer and Janome will provide good warranties that cover the sewing machine. They will also have many authorized repair shops to get any repair work done. And finally, you want to be able to purchase parts for years after you buy the machine. An unknown company may be out of business and not still manufacturing parts in a few years. The best sewing machine for a beginner is one that is easy to use. You want to look at how easy it is to set up the machine out of the box. You also want good control over the pace of the sewing with the foot pedal. Some machines don’t have responsive foot pedals. That means that you have to press all the way down on the pedal to get the sewing machine to start sewing. If you want to sew more slowly, you want a machine that has a responsive foot pedal. So when you start to press on the pedal, your machine starts to sew slowly. The pace should increase as you press down on the pedal. Some machines allow you to sew right from the machine without needing to use the foot pedal. While some people find this easier to use, I prefer a foot pedal because I like to keep both hands on the material that I’m sewing to guide it. The majority of your sewing will be based on the straight stitch. The best starter sewing machine will create the straight stitch easily, and it will look nice. I like to think of a good straight stitch as “crisp.” But you’ll have your own feeling. Look at how straight is the stitch. How well does it get made? What’s the underside of the seam look like? Ask yourself if you like how it looks. If you think it looks sloppy, you’ll never continue sewing. Finally, you should evaluate how easy is it to adjust the stitch length. You may want to adjust the stitch length as you’re sewing to get different effects. It should be a simple manipulation. The sewing surface is the part around the needle. The best sewing machine for beginners will have a large work area and be well lit. If it’s poorly lit around the needle, then you’ll have difficulties seeing where you’re at when sewing dark fabrics. The built-in stitch guide should be clear and easy to read so you can sew the correct seam allowance. I shouldn’t have to say there should be a built-in stitch guide. It looks like a ruler. Does it have a free-arm? When sewing sleeves or hemming pants, you want a free arm. That’s where you can remove part of the sewing surface to sew smaller circular sections. Some sewing machines have little tables that fold out. This can provide much larger sewing surface areas. This is very useful for large projects like quilts or a very cool cape. When you have a larger sewing surface, you can keep the fabric layers flatter, and you can be more aware of any fabric that could bunch up underneath. When you get your sewing machine, you’re excited! And rightly so. You want to take that machine out of the box and be able to start sewing in a matter of minutes, not hours. A good beginner’s sewing machine should be intuitive even if you’ve never sewn before. How easy is it to a thread? How easy is it to adjust the tension? How easy is it to change the needles? How easy is it to change a presser foot (snap on or screw in)? It’s nice when a quick start guide or a DVD is available. Some companies have YouTube channels with special video playlists to help a beginner get going quickly. You don’t want to spend a lot of time reading the owner’s manual to test if the machine works. Although, my best friend was a tech pub writer, and she would always remind me that someone spent a lot of time writing those owner’s manuals. So read them. Owner’s manuals also let you know of cool tricks and functionality that you’ll find very useful soon enough. The drop-in bobbin is considered easier to use for beginners. It’s also called a top-loading bobbin. The other type is the bottom-loading bobbin. It can sometimes cause the sewing needle to jam if the thread gets caught on the race mechanism. The drop-in bobbin is supposed to be more jam resistant. But the bottom-loading bobbin is easier to clear if you do get a jam. The drop-in bobbin requires less manual dexterity than the bottom-loading bobbin. So if you have difficulty with fine motor skills, you will want the drop-in bobbin. Unless you’re good with close work, you will want to get a machine that has an automatic needle threader. You pull down a lever that puts a tiny hook through the eye of the needle. You catch the thread into that hook and pull it through. While it’s not a magical wand, it does saves time and frustration. Many sewing machines have a built-in blade for cutting thread easily. It is one less step having to find scissors after you’ve finished sewing a seam. You pull out your material and then hook the needle and bobbin threads on the blade. On my machine, the threads often hang out there which makes it easy to find them when I’m ready to sew my next seam. Computerized sewing machines have the ability to place the needle in the fully down position when you stop sewing. This can be very useful when you’re seaming corners and need to rotate the material. None of the mechanical sewing machines have this, and you will need to turn the flywheel to move the needle yourself manually. The feed dogs are in the surface area around the needle. They move the fabric forward as you sew. A good sewing machine for beginners will allow you to drop the feed dogs for free form sewing or darning. Some machines come with a special plate that you use to cover up the feed dogs. You want to determine how well the feed dogs keep up with your sewing. That will determine how smooth your seams are. A good machine will have feed dogs that move smoothly. A poor machine will have feed dogs that jerk around. You want a machine that has a well-placed light bulb that illuminates what you’re sewing without being blinding. Older models have a halogen light, and newer models have LED lights. You will want to see where the light hits. Are the sewing controls clear and easy to use? Does it make sense how to use them? You want to quickly and easily know which control is for the stitch length versus stitch width, so you don’t make that mistake in the middle of a special project. If your machine has a lot of built-in stitches, you want an easy way to figure out which stitch you’re selecting. Some of the computerized machines have oodles of stitches. The older machines would have the stitch definitions in the owner’s manual. The newer machines have better ways of letting you choose decorative stitches without having to spend time looking it up in the owner’s manual which got misplaced. Is the overall cost versus features worth what you’re getting? Only you can determine that. I can suggest that you get a well-built machine that provides a solid straight stitch. You want something that is easy to use now that will grow with you for a little while. And you want to invest enough money in a good machine that isn’t more frustrating to use. I want to see more people like you sewing. That brings better fabrics and notions to the stores. So, get addicted to sewing by getting a great machine and learning to create.